It's all smiles now for Irish striker Sean Maguire who admits he was in tears when he was informed of the injury which almost derailed his season. The Kilkenny-born striker had endured the longest injury-enforced absence of his career as a hamstring problem, diagnosed last November, would put him out of action for 17 weeks. That forced him to miss a key part of the season for a promotion-chasing Preston side and also denied him the chance to play a part in Ireland's ill-fated World Cup play-off against Denmark. 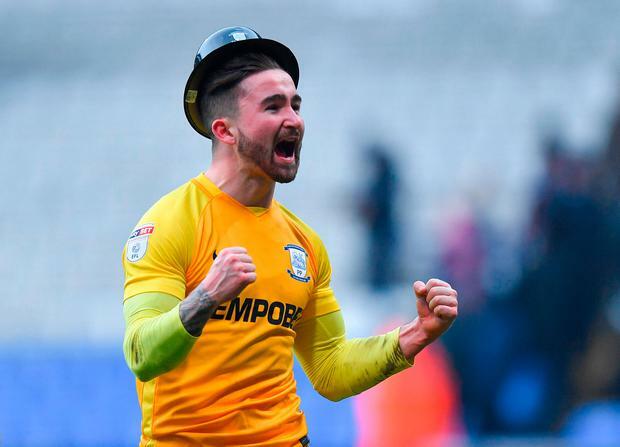 But Maguire burst back onto the scene on Saturday as he came off the bench to score twice for Preston in a 3-1 win away to Bolton, a result which boosts the Lancashire club's hopes of promotion. "You can't write this stuff," Maguire told the club's website. "To even be back involved with four thousand fans singing your name in a big game derby game that you have to win and to contribute to that and score two goals, it's the best feeling I've had in football. "Being out for four months and being frustrated a lot of the time, coming in knowing you're not going to be involved and in the matchday squad, so to be back here and to be involved was great. "Coming on did a lot for my confidence but to score my first brace for the club is the best feeling in my football career," added the former Cork City star. "When you're playing you don't really think about injuries, and I never thought I'd get an injury like that so it was a funny one. "I played two games with it, and when I got the scan and Jacko (pysio Matt Jackson) told me, I broke down in tears. "It's been tough, but everybody close to me has been great to me. "I just can't put into words how good that felt, but we won't get too excited yet. "We'll enjoy today but get back into training to get sharper and fit because it's a big 11 games for the club because we want to get into those play-offs." While Ireland have only friendly games to deal with for the next six months, Maguire's return to fitness is good news for Martin O'Neill, who is due in Dublin on Thursday to name his squad for the friendly away to Turkey in three weeks' time. O'Neill's options have been increased in recent days as Stephen Ward and Seamus Coleman both got in some valuable game time following injury. There were concerns over Jeff Hendrick when he was replaced at half time during Burnley's win over Everton on Saturday, but Clarets boss Sean Dyche revealed that the substitution was a tactical one. "I took Jeff off, purely for tactical reasons to get two up top, and it worked. I was pleased with that decision because sometimes you can wait, but sometimes you feel things need affecting," he said.